We have make this tutorial on how to auto refresh div content by using JQuery and Ajax with PHP Script. We have use JQuery load() method, that send requests to server and fetch data from server and by using Jquery selector we can refresh HTML div content without page refresh. In this tutorial we are going to learn auto refresh div content on regular interval by using JQuery and Ajax method in PHP programming. In this tutorial we will first Insert or form data into Mysql table by using Ajax Jquery method in PHP. After Inserting data into database then after by using Jquery load() method which fetch data from database. Then after this load() method has been used in Jquery setInterval(), this method will execute load() method on regular interval until we have called clearInterval(). 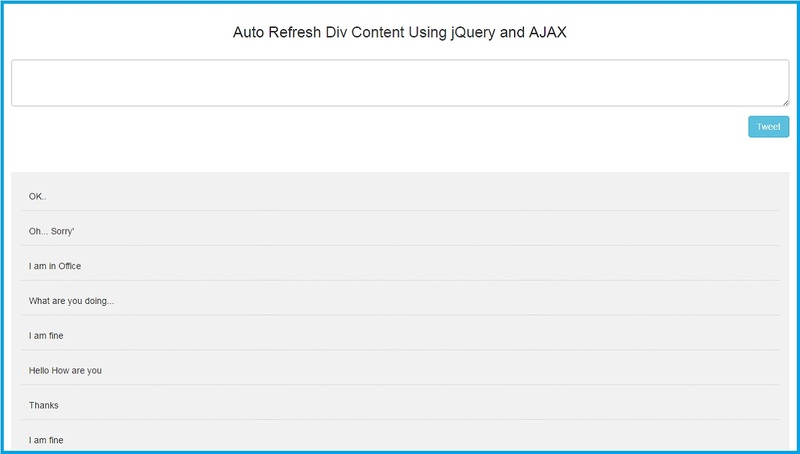 So this way we can Auto load and refresh div content on every predefine interval with Jquery and Ajax.